Lunch is cooling on the table. There is the rumble of dishes in the dishwasher and the washer is chiming that it’s done. Yesterday’s clothes are in the bathroom still and the kids desperately need a nap. But this is success. Beautiful, messy, unpolished success. How can I say that with everything half finished? Because I gave today 100% of what I have. I took care of my beautiful babies. It’s no secret that I’m not the best housekeeper. But that’s okay. I work the best I can and do what I can to make my home comfortable. The walls are filled with laughter, and the messes pile up. But that’s what living looks like. And that to me is success. 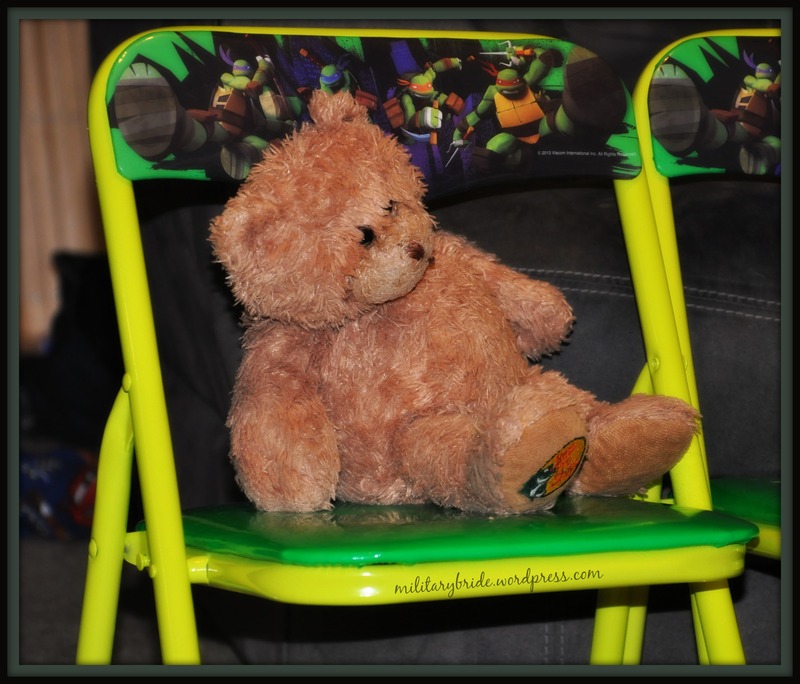 Posted in Baby, blogging, dogs, family, humor, life, Military Family, mommy, motherhood, Uncategorized and tagged housecleaning, nap time, toddlers. Bookmark the permalink. Someday, the night won’t be so scary. I won’t dread the lights being turned off, or of facing it alone. Thank you for seeing me through those first scary nights. Someday, I won’t take you everywhere. If you are forgotten in my world of imagination, just know that you helped me create it. Someday, I’ll stop sharing my food with your sweet stuffed face. But for now, we share every snack and every drink. You taught me how to share. Someday, I’ll stop dragging you through the mud. But for now, let’s squish some more. Someday, I won’t sneak you into the shower when mommy’s back is turned. You helped me learn that bath time is a lot of fun. Someday, the washing machine won’t be the end of the world. I won’t stand crying as you spin the excess water away. I won’t turn the dryer off a hundred times, trying to get to you sooner. But don’t think I stopped loving you. Someday, I’ll stop carrying you everywhere I go. But for now, your soft plush gives me the confidence I need in new places. You make mommy and daddy being gone, okay. Someday, I will leave home without you. You gave me the courage to face the world outside my home. Someday, I will explore the world on my own. You were my first adventure partner. I won’t forget the games we played. Someday, I will be big and strong. But you showed me that it’s okay to be soft on the inside. Someday, I’ll have a family of my own. You were my first practice as I copied mommy and daddy. Someday, my little ones will have a best friend too. I won’t try to stop it. I know how precious your first best friend can be. I love you, Ted Ted. I always will. Posted in blogging, family, life, military family and tagged baby boy, best friend, blue eyes, dryer, exploring, growing, growing up, imagination, learning, mud, playing, stuffed animal, Ted Ted, washer. Bookmark the permalink. My poor furbaby has had a growth on the side of his paw. Between him and the other pups, they wouldn’t stop licking the wound. His poor paw was swollen and it was starting to bother him when he went for walks. We felt horrible and took him in to the vet. They said that it was cancer. There isn’t a whole lot we can do. He either has the kind that will spread, or he doesn’t. We could do a surgery and remove the cancer spot, but it’s horribly expensive and when we get it removed, there is only a 50% chance he will come out okay. I’m heartbroken. Domino is my first baby. My first pet that is solely mine. Well, I guess he’s hubby’s too, but he has been my baby. 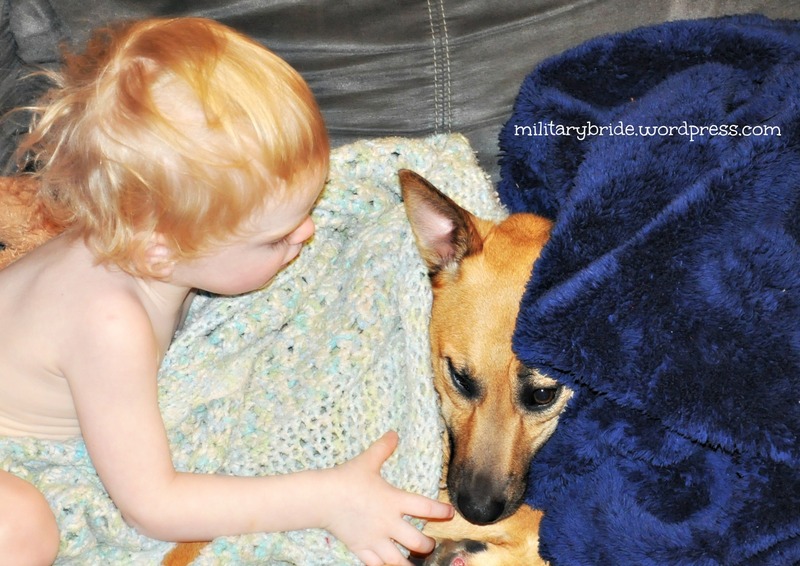 He is my protector, and loves my kiddos even if he doesn’t always like them, he protects them. After hearing what the doctors said my hubby and I decided we wouldn’t put my baby through that pain. We would let him be happy until he is in too much pain. We tried putting a cone on my furbaby, but the other dogs kept licking his paw. We gave up on the idea of using a cone to heal his paw. And then one day we noticed a white spot showing on his paw. It got bigger and bigger until all of a sudden it was gone. Clear liquid and then he started acting like the old Domino. He’s been playful and happy, and even tolerating the kids laying on him. I hope that means he was able to get rid of his own cancer. It may not be the case, but either way, he got rid of what the doctors were looking to get rid of. 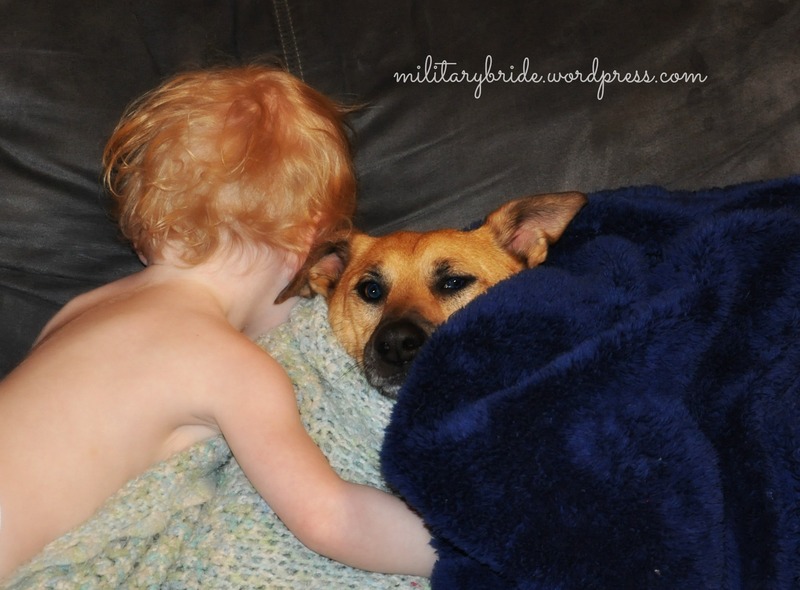 Posted in blogging, dogs, family, life, military, military family, milspouse, mommy and tagged baby, cancer, dogs, domino, furbaby, military family, military life, mommy, motherhood, puppy, sick. Bookmark the permalink. 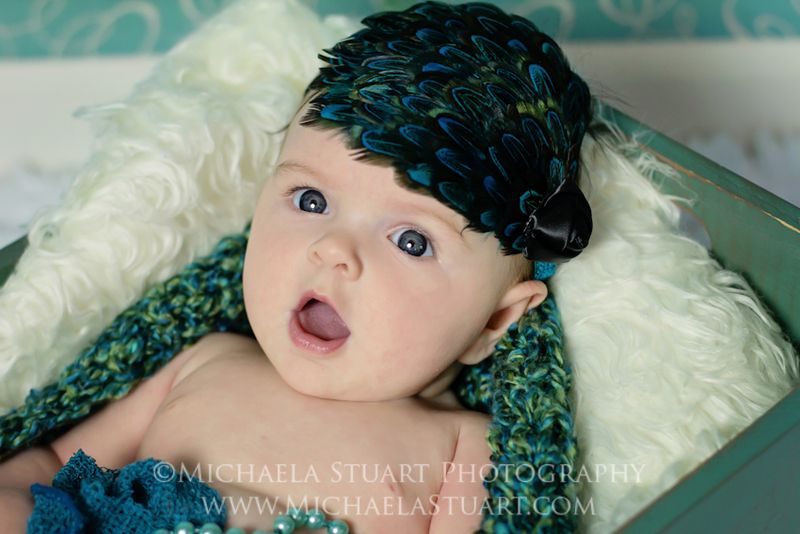 More of my baby’s pictures came back today. Incredible! Little bug was cranky and really didn’t want to cooperate. Look at the shots she managed to get anyways! 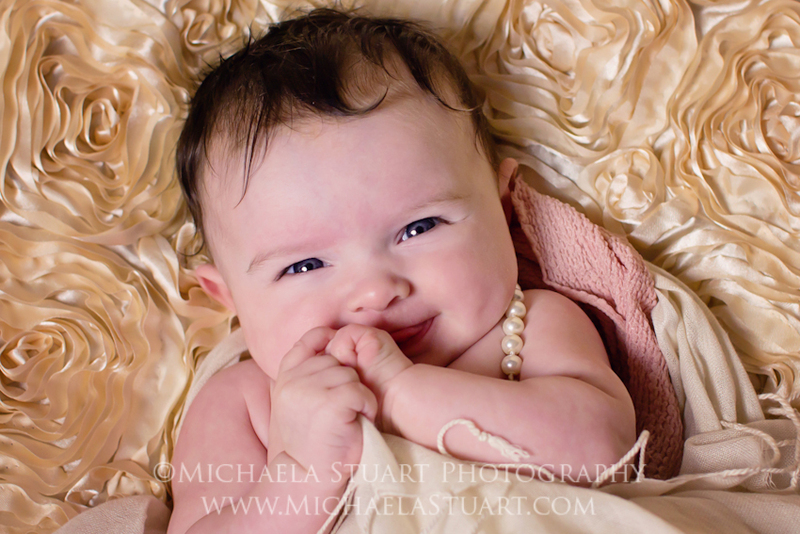 Look how happy she is with a string of pearls! She is her mama’s daughter. 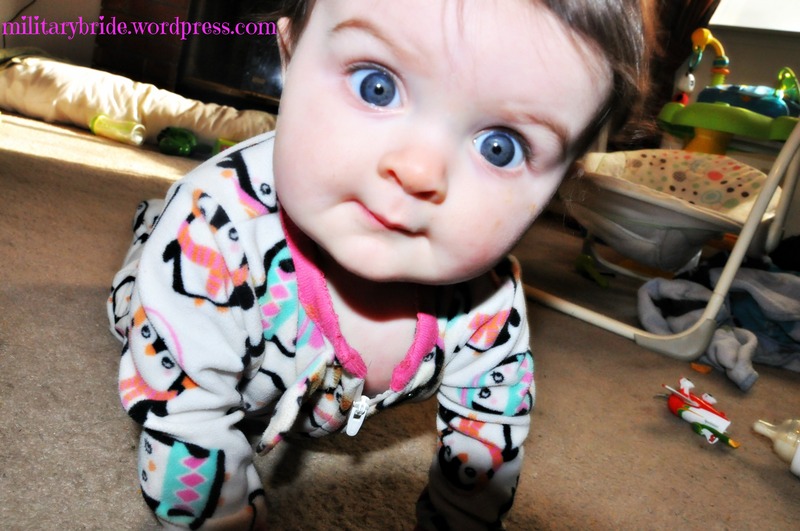 Posted in Baby, blogging, family, girls, life, military family and tagged baby girl, baby pictures, feather headband, girl, life, military family, military life, motherhood, pearls, photography, sweet baby. Bookmark the permalink. We got our little miss’ baby pictures done! Michaela Stewart is an amazing photographer. I love that she was able to do our little monster and our little bugs photos. Look how amazing-ling similar my babies features are! I love my babies. They grow up way to fast. 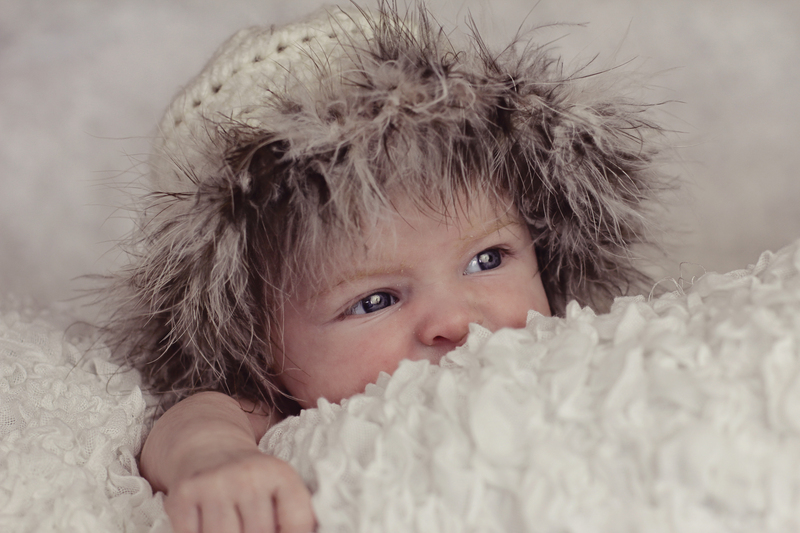 Posted in Baby, blogging, family, Uncategorized and tagged baby, baby boy, baby girl, baby pictures, babys first photos, Michaela Stewart, Michaela Stewart Photography, military babies, photographs. Bookmark the permalink. I know I’ve been super quiet lately. Sometimes life just needs you to slow down for a minute and live. My beautiful babies are getting way to big already. The other day I was giving Little Bug a bottle and she pushed my hands out of the way to hold it herself! She’s only three months, where has the time gone? 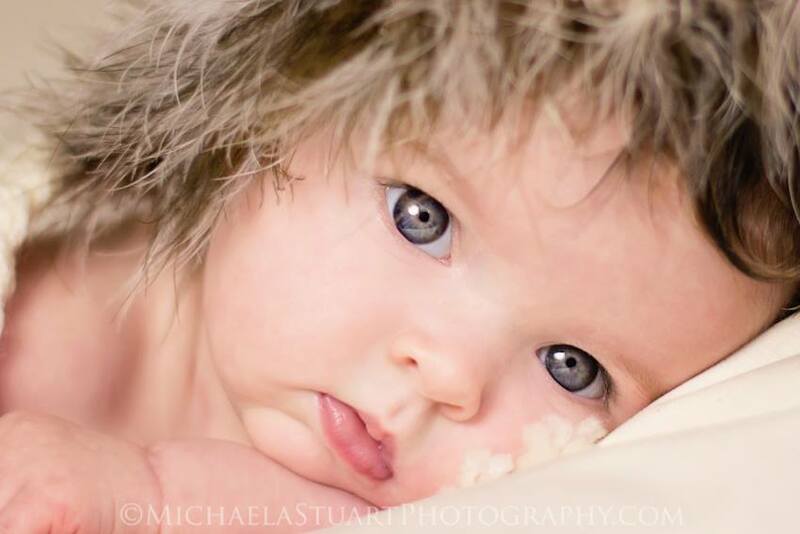 We are getting her baby pictures done very soon, with the same wonderful lady who did Blue Eye’s photos. 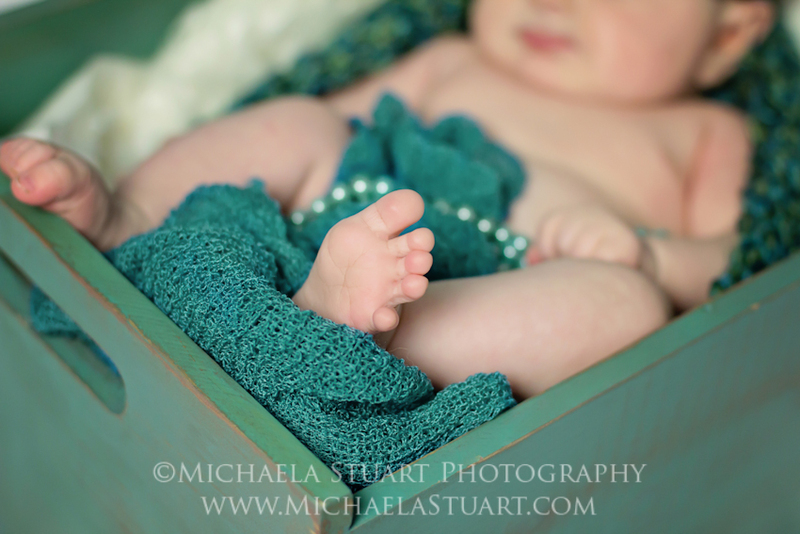 Michaela Stewart Photography is a wonderful photographer. And with little bug starting to roll places, we needed to get her pictures soon! I can’t wait to see what we come up with. I’m starting to think my son is more like me than I originally thought. He’s not even two and he has managed to scar underneath his eyebrow and another under his lip. Well, last night he managed to take of running and fall into his sippy cup. He busted his chin open and now he has a golf ball sized lump on his chin. It’s so sad, but my little daredevil will be okay. Hubby is doing good. We’re coming up on PRT season. I say we, because our whole life changes for a couple weeks. We eat healthier, we exercise, and hubby watches what he’s doing so that he makes sure he’s okay with his prt. I don’t mind, in fact, I wish we ate healthier all the time. I do enjoy when we can go for walks in the evenings. I’m sure you military wives can relate to some extent! I also have my first craft booth! I’m excited to see how it goes. Wish me luck. And if you don’t see me on here for a day or two, I’m getting ready! 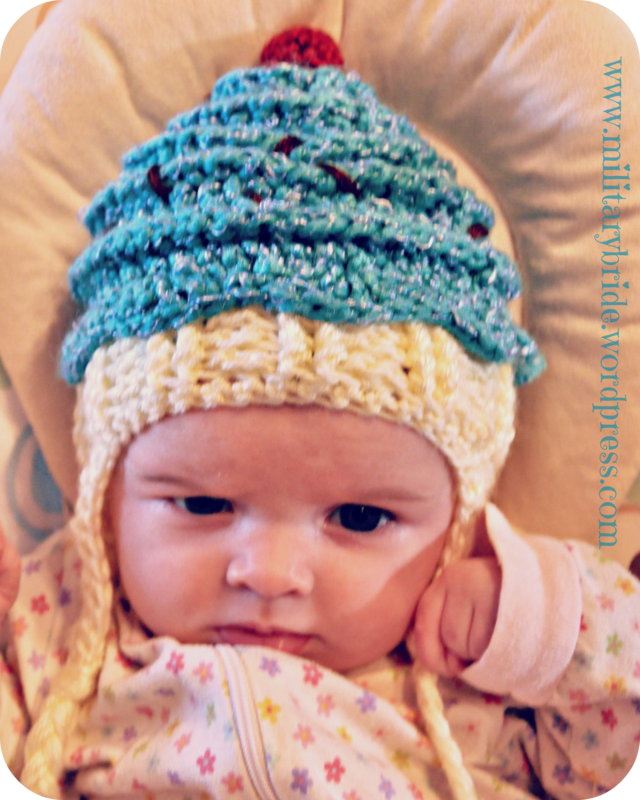 Posted in Baby, blogging, boys, crochet, family, girls, life, Life Lessons, military, mommy, Parenting and tagged baby booboos, booth, craft show, military life, military prt, rolling. Bookmark the permalink. Here a project, there a project…. everywhere a project. I’ve had a lot of projects to finish up lately. Some I tried to do before my little girl was born, but just couldn’t do them all. A couple, I’ve been dying to try. And a two small beanies, I’ve been looking forward to making for Halloween. I don’t have as much time as I used to (what mother with two little ones does?) 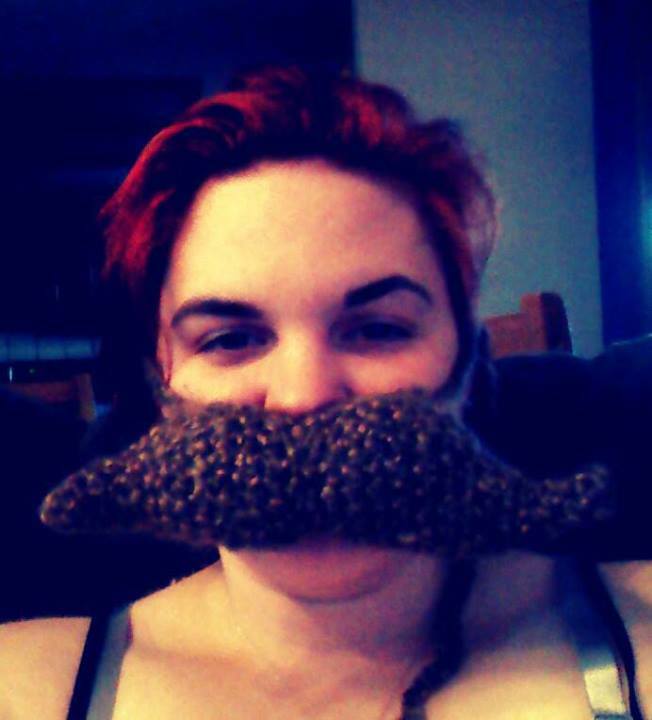 but I’ve been crocheting at nap times or sometimes when my hubby and I watch a movie. I love to see the results, and there is something so satisfying with creating something from your own hands. That being said here are a couple of my finished projects! I have to admit, this project was originally for my husband. He and a friend of ours went to a baseball gam and you got in free with a mustache. Since I have made hubby swear to NEVER grow a mustache again, I decided I would make him one. This lovely pattern comes from Easy Makes Me Happy. I obviously made mine a lot bigger, but I love how simple it was and every easy to understand. 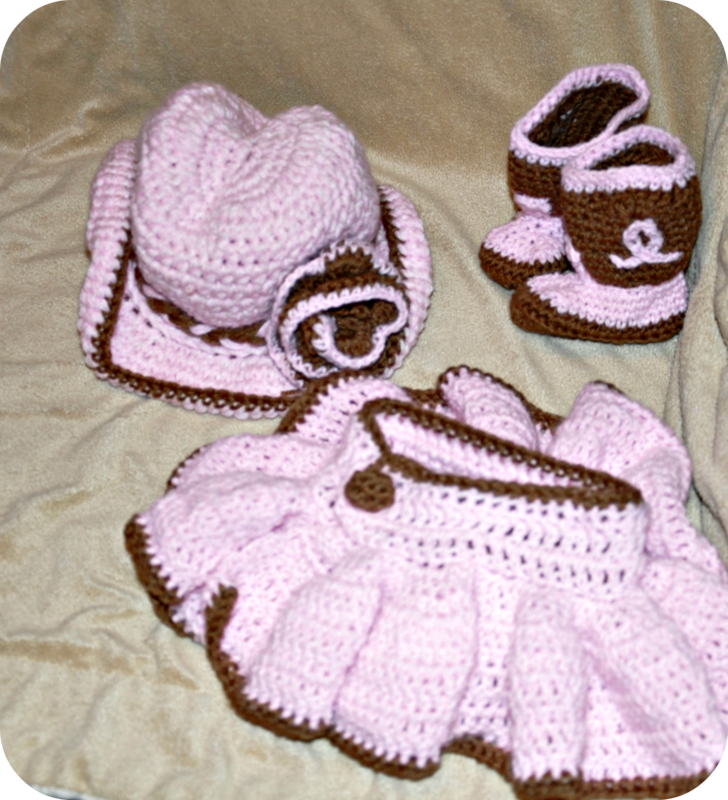 The outfit pattern came from Follow the Stray, but she also got her pattern from Repeat Crafter Me and Flower Creations. I have to insert my opinion here. 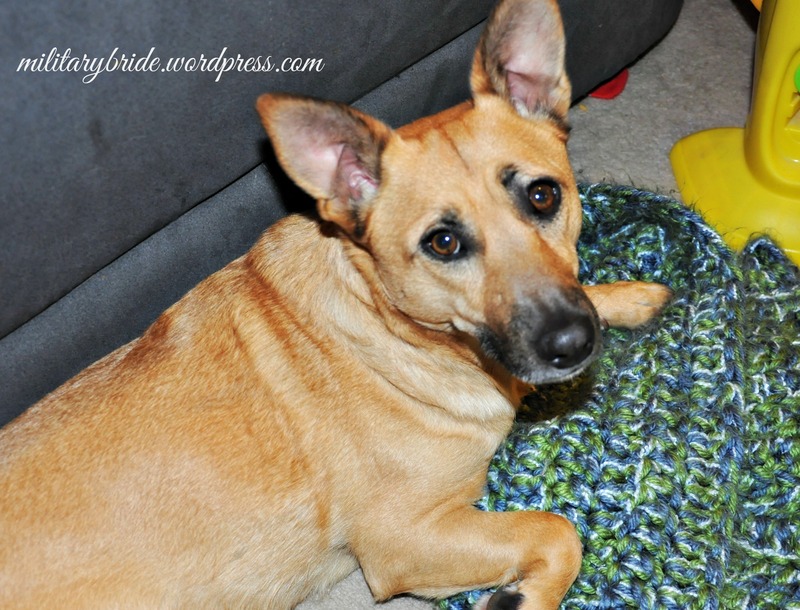 Repeat Crafter Me has amazing free crochet patterns. I’ve followed her patterns a couple times and always had great results. She is also willing to explain things that are confusing. This sweet hat pattern came from the Lovely Crow. But what’s a cowgirl hat without boots… I didn’t buy her pattern but I did find this pattern to use, from Hodge Podge Crochet. I also used the “Minnie Mouse” skirt again here. I love how sweet this little cowgirl outfit turned out. This is the one I’ve been dying to do. I have to admit though, I could not find a pattern I liked, so I made my own. It wasn’t as hard as I thought, but now I’m trying to get the pattern together to share with all of you! If I have enough people wanting the pattern, I will create a separate post with the pattern, but otherwise, enjoy the picture of my little bug. I also recently tested two amazing hat patterns, but I need to wait for it’s release to share with you the picture and site to find it on. The other project I was working on, I’m not ready to share yet. I have both of my babies Halloween costumes started, but I would like to finish Hubby and mine too before I share with you the cuteness that is my babies. Please Note, I try to give credit to the creators of the patterns, but sometimes I loose track of which pattern I used, who created it, or I’ve adjusted it so much it really isn’t their pattern anymore. If you ever notice an error, please don’t hesitate to help me give the author of the pattern credit. 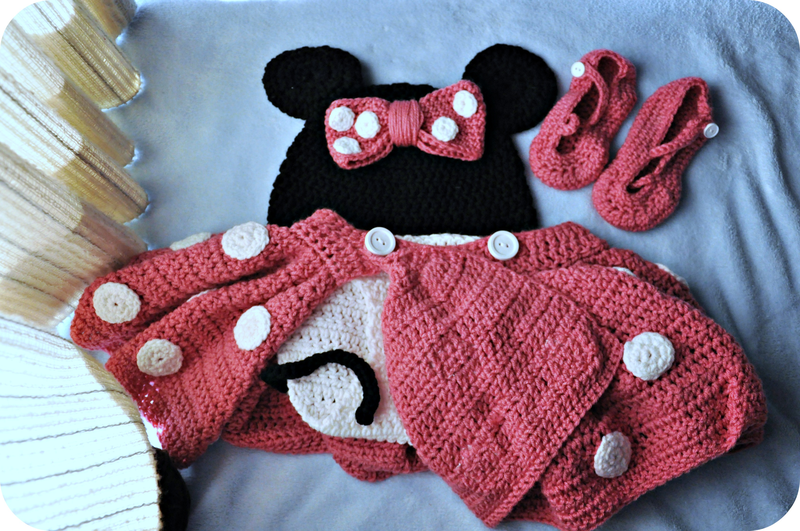 Posted in Baby, blogging, crafts, crochet, family, humor, husband, life, military, military family, milspouse, mommy, motherhood, photo, Uncategorized and tagged art, baby, boy, Cowboy hat crochet, Cowgirl Outfit, crafts, crochet, Crochet Mustache, cupcake hat, cupcake hat crochet, DIY, family, girl, home, life, Minnie Mouse Crochet, Minnie Mouse Outfit, Mustache, photo, projects. Bookmark the permalink. Well it’s finally happened! Blue Eyes can open doors. He’s been running since 7 months. 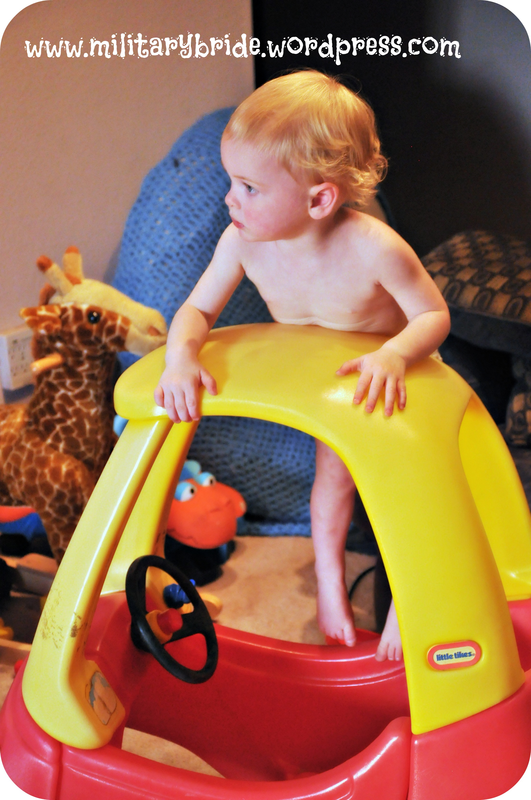 He’s been climbing on things just as long. And now, it’s happened. He can open the doors. My life won’t be nearly as simple as it used to be. I put him to bed about 830 like normal. I thought he was out cold. I didn’t hear any noises and he was so happy to take his blankie and curl up with his milk. I was starting to consider going to bed myself when I see a blonde head pop up from behind the couch. Super quiet he came over and gave me a hug and goes “mom, mom” and then takes his blankie over to the big floor cushion I made, curls up and sits there with his cars driving them on the couch. He’s being so good and quiet that I can’t send him back to bed. He also didn’t get his second nap until way later than normal. So maybe he can have some mommy time. He’s now playing in the curtains, laying there like it’s a vertical blanket. Our whole family has been sick lately. It started with daddy and eventually went to both kids and mommy. It hasn’t been too bad but daddy is cranky and grouchy. Blue Eyes needs more sleep but seems to make him sleep less. Little bug needs more sleep, but she’s doing okay. Little bug is amazing. She got onto blue eye’s schedule so quickly. She wants to go to bed at 800 and if you don’t put her to bed, she will cry until you wrap her up and tuck her in. She only gets up at midnight and four. I’m so blessed. She is smiling now, and has even managed to roll herself over a couple times. I’m not sure where that falls on the timeline of development, but I’m pretty proud of my little girl. 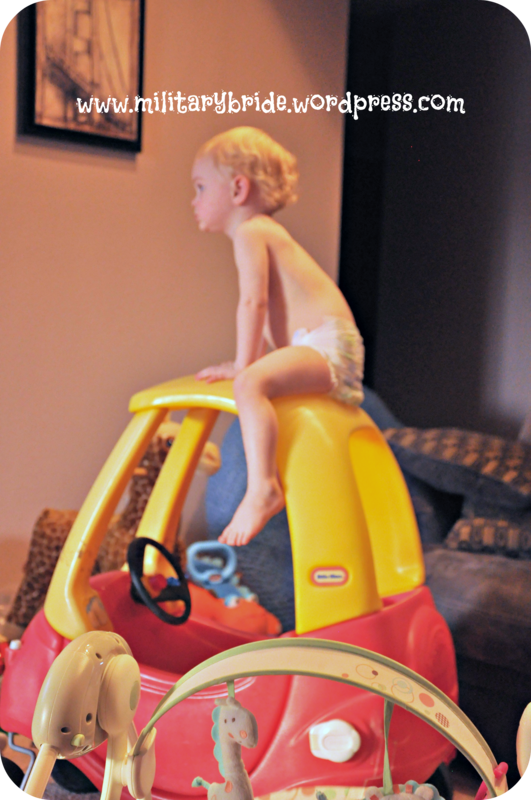 Posted in Baby, boys, family, girls, health, husband, life, military, military family, mommy, motherhood, navy, Parenting, Uncategorized and tagged baby, boy, climbing, kids, open doors, rolling over, sick, sleep. Bookmark the permalink.